Pure Sirocco 150 review | What Hi-Fi? This Pure Micro is not just 'Made for iPod'; it's also the world's first DAB micro system to boast 'Works with iPhone' certification. This means it's certified to meet Apple performance standards – and that you won't have to put your iPhone in to 'Airplane Mode'. The Pure Sirocco 150 certainly packs in the features. 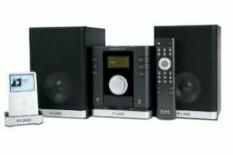 There are DAB and FM tuners alongside the CD player and iPod dock, while USB and SD card inputs and a front-mounted 3.5mm input complete an extensive sweep of possible sources. We don't expect the world sonically from something of this price, but we're still disappointed with the results. Listening to the remastered release of the Beatles' Abbey Road, the sound is lightweight and insubstantial; a lossless file via the dock and an iPod Touch is similarly lacklustre. Flick the bass mode on and Simian Mobile Disco's Cruel Intentions sounds flat or, with 'bass mode' on, more powerful but woolly in the bottom end. If you want something fairly cheap and fairly cheerful, this Pure will do a job. We'd spend more for better quality – or less and live with fewer functions.